The 164th session of the Diet ended yesterday. It was the last Diet session that I would be attending as Prime Minister. Thanks to your support, a number of government-proposed bills were passed under the stable coalition government of the Liberal Democratic Party (LDP) and New Komeito. I would like to express my gratitude to all the people, beginning with the members of the ruling parties, and to everyone in the opposition parties as well for their cooperation. Amid the very tight fiscal situation, coupled with the plethora of difficult economic and financial issues relating to how to promote the ongoing economic recovery, the FY2006 budget successfully passed the Diet before the end of FY2005. Thanks to your support, we were able to keep the amount of the issuance of new government bonds to below 30 trillion yen as well as to trim back general expenditures to below the FY2005 level. Normally many would be calling for further budget increases and protesting against a budget that was smaller than the previous fiscal year's, citing the stagnant economy as the reason. Yet despite the fact that we have held down the issuance of government bonds and general expenditures to below the levels of the previous fiscal year, it appears increasingly likely that for the last fiscal year and most likely for this fiscal year as well, the natural increase in the tax revenue will be greater than the estimated amount. We have to continue with reforms in this context, and it was under this recognition of the ruling parties that a number of bills were passed, including the administrative reform promotion bill. There will be no end to the reforms. After I step down, a new Prime Minister will take office in September, and this Prime Minister will continue to nurture the buds of reform into a large tree. I believe we have begun to make steady progress on the path to advancing reforms for economic revitalization and the enhancement of people's livelihoods. Once again I would like to express my gratitude to everybody for their encouragement, support and cooperation. QUESTION1: Prime Minister, you gave your reasons for not extending the last Diet session as that you have many things to do, and that you had judged the matter comprehensively. With regard to the revision of the Fundamental Law of Education and several other bills, these bills will be entrusted to the extraordinary Diet session to be held in the autumn or beyond now that the Diet session has ended without extending its session. Concerning this matter, the Democratic Party of Japan (DPJ) has pointed out that the present cabinet is actually an LDP presidential election management cabinet. During the remaining three months of your term as Prime Minister, you have a diplomatic schedule that includes visits to the United States and Canada and an attendance at the G8 Summit. But in addition, what are the things you have to do that you are drawing up in your own mind? Please tell us in concrete terms. PRIME MINISTER KOIZUMI: First of all, there are the Guidelines for FY2007 Budget Requests that will determine the framework of the budget for the next fiscal year. From the end of June through the beginning of July, serious discussions will take place between the Government and the ruling parties. We have to decide on the framework and the basic policy for the next fiscal year's budget. The Guidelines are vitally important under the present difficult economic and fiscal conditions, which require consideration to be given to both aspects: the future reform track and moreover economic revitalization; and financial rehabilitation. Since there are divergent opinions on this issue even within the ruling parties, I believe it will require considerable discussion before the policy is finalized. I will be visiting Canada and the United States next week. A little after that, at the start of July, the G8 Summit will be held in St. Petersburg in Russia. Then in September, we are scheduled to hold the election to decide the next President of the LDP. Accordingly, issues are piling up and I have a lot of work to do. Why did the Prime Minister not extend the last Diet session-many reports have appeared criticizing me for not extending the Diet session. I think this is a very interesting and a very curious thing. The entire opposition, including the DPJ, the Japanese Communist Party, the Social Democratic Party, was opposed to an extension. Before the decision not to extend the session was made, were any opinions expressed in the mass media that bills-whether the revision of Fundamental Law of Education, the national referendum bill for the revision of the Constitution, or the bill to criminalize conspiracy as a crime prevention measure-should be passed in the last Diet session? I contend that such opinions were expressed rather rarely. I dare say that arguments urging that things should not be rushed and that the issues should be discussed carefully were more numerous. However, no sooner had I decided that I would not extend the Diet session than the tone of the argument changed to "Why does the Prime Minister not extend the session?" The reason for extending the session is so that pending bills can be passed within the current session, isn't it? It cannot be helped because it is said that the job of the press is to criticize, but I pay full attention to the opinions expressed by the opposition. The entire opposition was for the idea of not extending the Diet session. The entire opposition said we should thoroughly deliberate the Fundamental Law of Education. With regard to the Fundamental Law of Education bill, the national referendum bill, and the bill to criminalize conspiracy as a means of preventing international crime, I do not think there is much confrontation between the DPJ, the largest opposition party, and the ruling parties on these issues. Also, if the largest opposition party is genuine in its enthusiasm to be in charge of the administration in future, these are not the sort of bills that it would dare to stop, or even to mount a confrontation over. Perhaps these are issues on which we can find mutual points of agreement if we discuss things thoroughly. I made the decision not to extend the last Diet session by judging points such as these in a comprehensive fashion, and also by paying attention to the opposition's opinions. QUESTION2: I would like to ask about the LDP presidential election. You have said that the presidential election will be a severe power struggle. Concerning this election, which will decide the party president after five years of the Koizumi administration, I would like to ask you about what kind of significance the election has and including what kinds of points it should be contested over. My second question relates to your statement that you will announce which candidate you will be voting for before the date of the election. In that case, which elements do you consider the most important in deciding which candidate to vote for? Please share with us your thoughts on these two points. PRIME MINISTER KOIZUMI: Up to now it has almost always been the case that the LDP presidential election has also determined the choice of the next Prime Minister of Japan. So in this sense I think it is an important election that differs from the elections held by the opposition parties to select their leaders. I am certain that any candidates who vie for the presidency will possess the ambition to govern the nation as the Prime Minister of Japan and not merely as the President of the LDP, and also that they will announce their basic policy concerning the ideal image of Japan and the priority issues that they would tackle upon assuming the post of Prime Minister. Up to now, under circumstances in which the economy has been mired in stagnation and people were concerned that the economy would be slipping into a deflationary spiral, my administration has finally restrained the issuance of government bonds and pruned back general expenditure to a level lower than the previous fiscal year, and yet the economy has moved back onto a recovery track. This is an extremely important issue for the future Prime Minister and LDP President. The next administration will have to revitalize the economy and simultaneously proceed with the rebuilding of the nation's finances. If we are to make the nation's future burden lighter, the issuance of government bonds has to be held down, and the tax increase range must be minimized. Even if the natural increase in tax revenue is higher than forecast, it will be very difficult for the administration to move in the direction of using the increase in tax revenue to fund increases in general expenditure of all ministries. Accordingly, how can we cut down on expenditure? How can we cut back on the non-essentials and increase spending on the essentials? We cannot reduce everything uniformly. It is necessary to have some variation. Then, if spending on the essentials is to be increased, spending in many other areas must be reduced. How the next LDP President and Japanese Prime Minister will tackle this issue while obtaining the understanding and cooperation of the ruling parties is an extremely important question. Sometimes the LDP President/Japanese Prime Minister has to persuade the members of the ruling parties with a firm determination to face their objections. At other times, he has to gain cooperation of the members of the ruling parties to proceed with and finalize various arguments smoothly. Both of these tasks are important. One must act on a case-by-case basis, and if one makes the mistake of taking a hard and soft approach, the consequences could be serious. What is important and what is trifling differs from person to person. What is important according to the Prime Minister, what is important according to the ministries and agencies, what is important according to the nation, what is important according to the ruling parties, what is important according to the opposition-It is fine even if there are differences between all of these. However, as the nation as a whole, as the LDP President and as the Japanese Prime Minister, do we not need to consider what is important and also what sorts of harmonious adjustments should be carried out among so many people? Sometimes when one shows leadership one is called a dictator. Sometimes when one attempts to ensure harmony within the party and to delegate things to other people one is said to be leaving all the decision making to others. I think it is very important to have a side that displays leadership without fearing such criticisms and also to have a side that delegates things to reliable people within the party. In addition, to be able to use both of these sides it is important to have breadth as a human being, confidence, ambition to govern the nation, and a passion to patiently resolve the issues that one sets for oneself to tackle in a prioritized manner. Over more than 30 years as an LDP Diet member, I have witnessed quite a few party presidential elections. On some occasions I have been a candidate placing myself in the vortex of the power struggle and losing. On one occasion I was victorious. In the present era, where the election of the LDP President will determine the next Prime Minister under the control of a political party, the candidates may go through some rough but nonetheless very important scenes in the course of the power struggle. Perhaps this will also be a time when human relationships sustain damage. However, concerning the issues of how to revitalize the Japanese economy, how to stabilize the people's livelihood and how to secure the safety of Japan, I want the candidates to tackle these inescapable issues powerfully, vigorously and cheerfully based on a comprehensive standpoint. Sooner or later, all the presidential election candidates will have declared themselves. It is not clear at present precisely who will and who will not be standing as a candidate. Even among those who are considered as candidates, some may run and others may not, and someone may yet emerge from among those who are not now being considered as candidates. At the stage when all the candidates who are qualified to be candidates in the LDP presidential election have been recommended by at least 20 LDP Diet members, I think I will have to make clear-as I myself have one vote- who I will be voting for. Until that time, however, I have no intention of making any statements about who would be a good or a not so good choice. QUESTION3: Prime Minister, there are signs that North Korea may be preparing to launch a Taepodong-2 ballistic missile. As the Prime Minister who signed the Japan-DPRK Pyongyang Declaration with North Korea, what actions do you seek from North Korea? If the missile is launched, how will the Japanese Government respond? PRIME MINISTER KOIZUMI: In our talks with the North Korean and my own meetings with General Secretary Kim Jong Il, we have appealed to the North Korean side that it has little to benefit from developing and possessing nuclear weapons. I have said that the surest path for North Korea to ensure its security and the best way for North Korea to develop would be to abandon its nuclear development programs and to return to the international community as a trusted and responsible member. This stance remains unchanged. Recently I have received reports of signs indicating that North Korea may launch a missile. In coordination with countries including the United States and the Republic of Korea, Japan has conveyed to the North Korean side our request that it should refrain from such activities and has been calling on the North Korean side through various channels to act rationally and with such restraint as not to launch the Taepodong or any other missile. It remains my hope that North Korea will not launch a missile. However, if North Korea does not heed our views and launches a missile, I believe the Government of Japan must take stringent measures in consultation with other governments including the US Government. As for the nature of such measures, I believe it would be better if I were to refrain from commenting at this point in time given my position as Prime Minister. QUESTION4: I would like to ask a question concerning reconstruction assistance to Iraq. It is said that consultations are underway in Iraq on the issue of the transfer of security responsibility. What are your thoughts on the withdrawal of the Ground Self-Defense Force (GSDF) currently on dispatch to Samawah? Also, what are your thoughts on assistance to Iraq following the withdrawal of the Self-Defense Forces (SDF)? 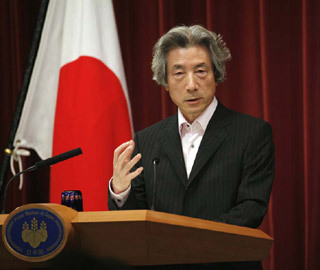 PRIME MINISTER KOIZUMI: Japan's SDF personnel are undertaking dedicated efforts in Samawah, Iraq. Thanks to each and every one of the SDF personnel who have worked hard and earnestly in carrying out their activities, in the knowledge that they are executing the goodwill of the people of Japan, the SDF's activities in Iraq have earned high praise from the Iraqi Government, the Iraqi people, and the people of Samawah. With the activities of the SDF, Japan has extended assistance that will serve as a source of encouragement to the Iraqi people in building a government for themselves in a stable Iraq, for the people, by the people. I would like to continue this assistance even after the supposed SDF redeployment from Samawah. As for what kind of reconstruction and humanitarian assistance we can provide to Iraq, I believe the redeployment of the SDF, when it occurs, must be executed smoothly in close coordination with the various parties, including the US Government and the UK and Australian forces that have been lending their cooperation to ensure the safety of the SDF in Samawah. When the time comes, the decision on the best time to redeploy will be made appropriately. I want to ensure the safe return of all the SDF personnel with the consent of the other countries involved and the consent of the Iraqi Government. In addition, I would like Japan to continuously think about how it can contribute to the stability of Iraq as a responsible member of the international community and to carry these ideas forward.